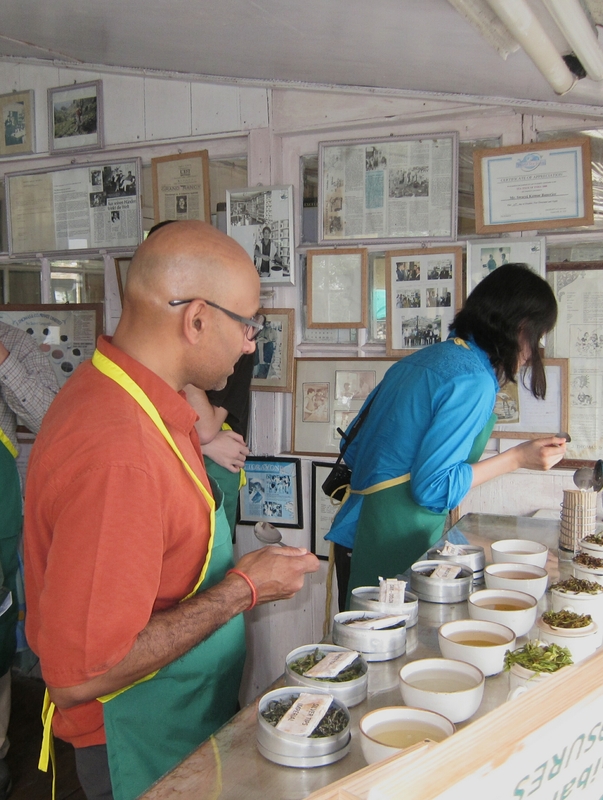 After touring the factory at the Makaibari Tea Estate with a group from Young Mountain Tea, I joined them in a tea tasting session with Rajah Banerjee, the owner of the estate. 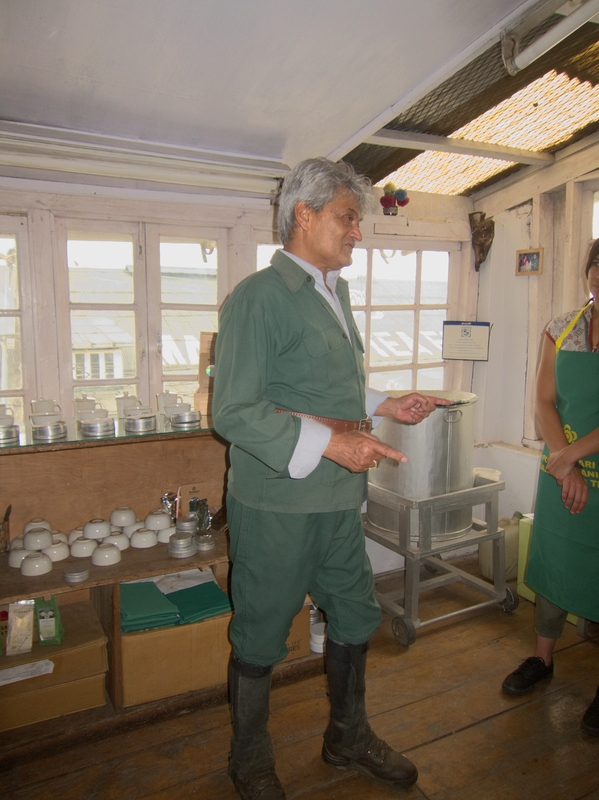 Under Mr. Banerjee’s leadership, Makaibari has become the most famous of Darjeeling’s 87 tea gardens. A fourth generation tea planter, he is known for pioneering natural growing methods and social welfare programs. Makaibari was the first tea estate in India to be certified organic, and the first tea garden in the world to be certified biodynamic. In 1990, tea plucker Maya Davi Chettrini became the first woman supervisor in a Darjeeling tea garden. With the goal of helping tea workers generate additional income for themselves, Mr. Banerjee initiated the homestay program in which I participated. 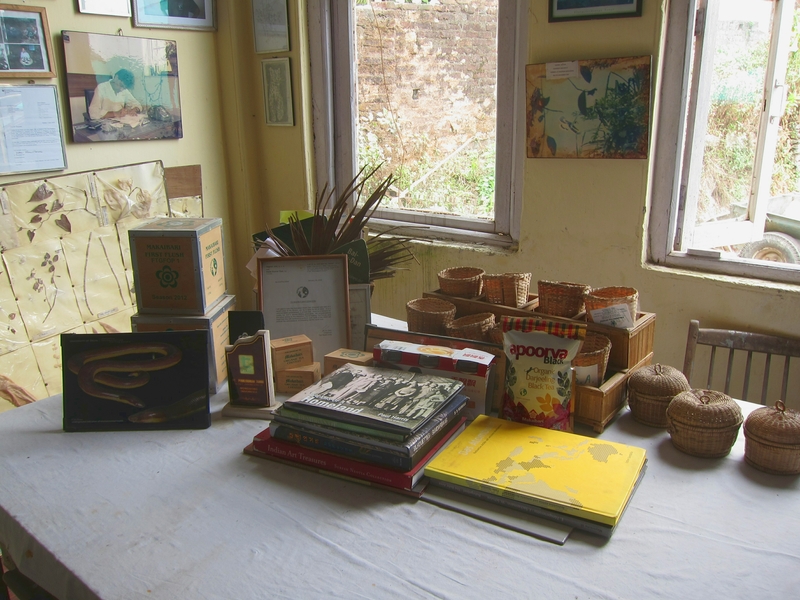 He has started many other social programs such as a nursery and a library. 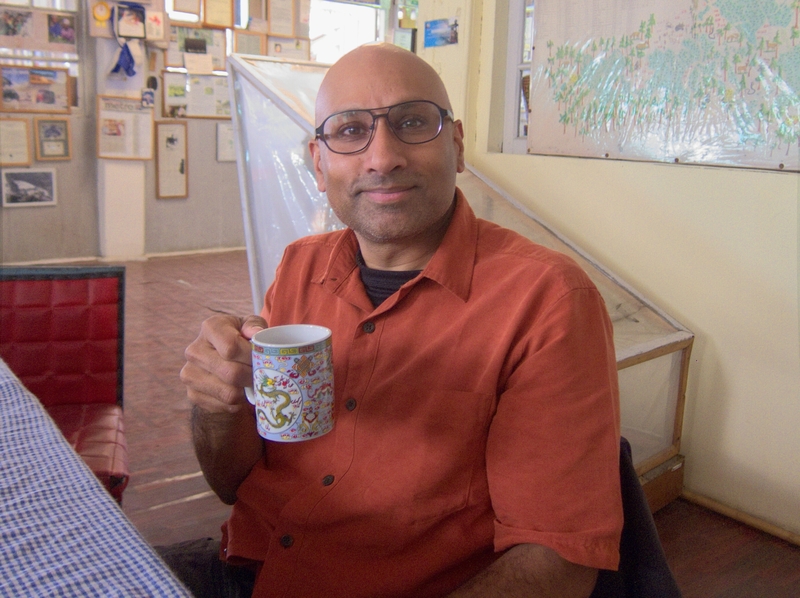 Having a cup of tea while waiting for Mr. Banerjee to join us. Darjeeling tea plantations often have absentee owners, but Mr. Banerjee is a daily presence in the factory and the fields at Makaibari. Although a Bengali, he has learned fluent Nepali to communicate better with his employees, according to Pushpa, the Nepalese hostess of my homestay. 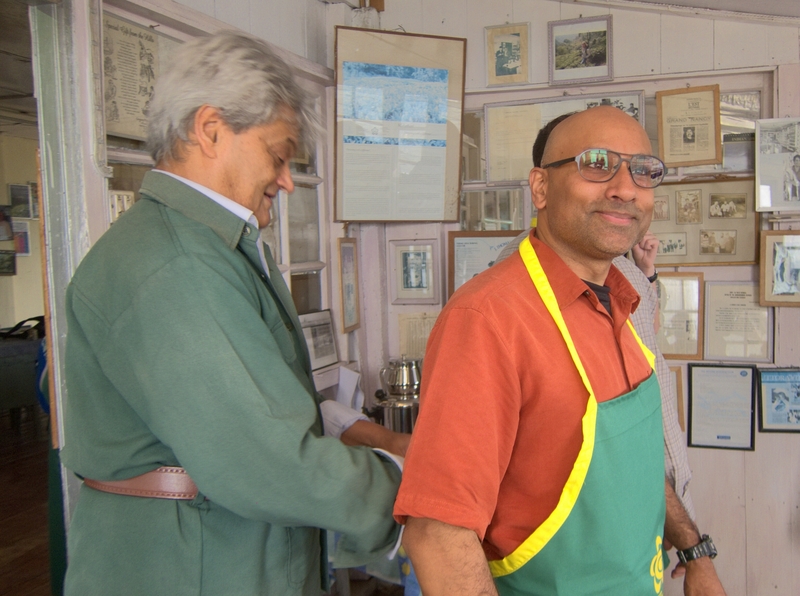 Mr. Banerjee began by tying aprons on each of us. Then, between telling anecdotes and joking with us, he taught us how to taste tea: slurping noisily and at length, in order to aerate the liquid and bring out the full flavor. We tasted six different Makaibari teas, one at a time, and he asked each of us to identify the first flavor that came to mind. He held our attention throughout with his cheerful and engaging banter. He expounded on the importance of battling climate change and lamented about the detrimental effects of monoculture tea farming. 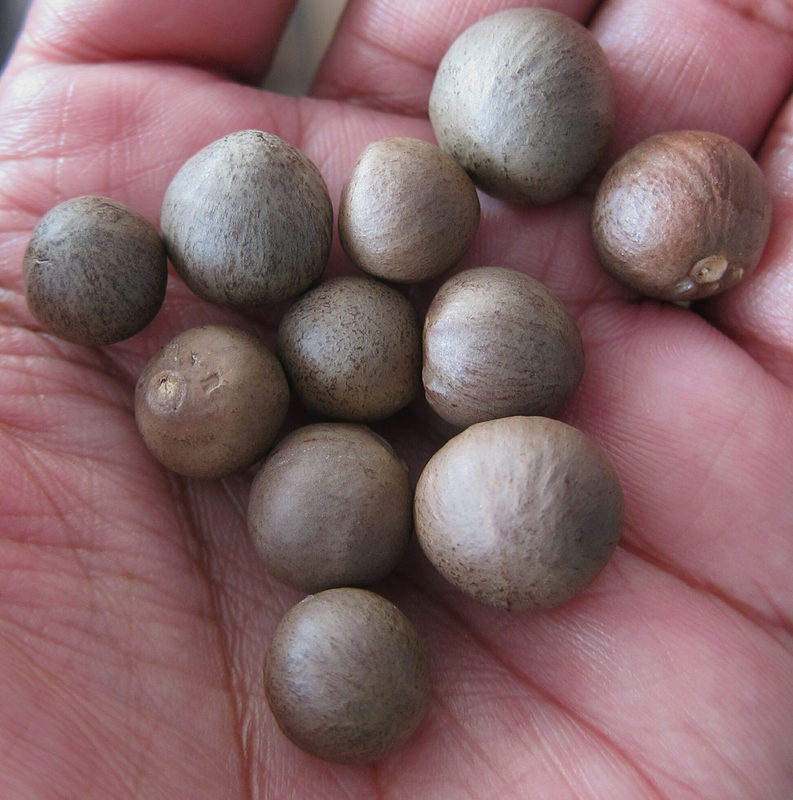 At the end of our tasting session, he gave each of us a handful of tea seeds. 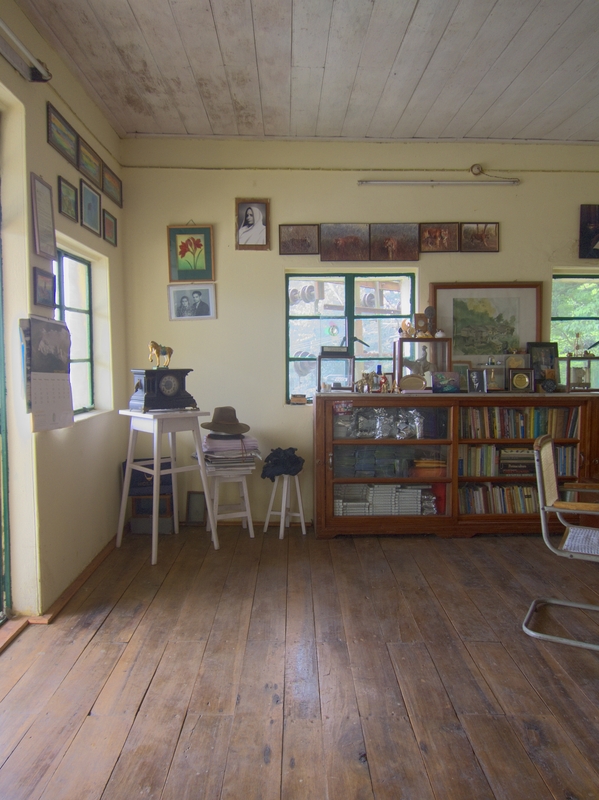 Later, as we posed for photos with him, I looked around the office and noticed various objets d’art, awards, photographs and framed letters from other significant people in the global tea industry. Mr. Banerjee’s great-grandfather founded Makaibari and set up the world’s first tea factory in 1859, but Rajah Banerjee will likely be the last of his family to head Makaibari. His children have not followed in his footsteps, and a few years back, he sold most of his shares to Luxmi Group, a large Indian tea conglomerate. I hope they will continue to run Makaibari in a way that is true to the vision of Rajah Banerjee. Subhro Niyogi. “Iconic Makaibari tea changes hands.” Times of India. 11 June, 2014. Not sure about the taste, Mythri. Mr Banerjee is a world famous character, indeed!